The Agricultural Hall in Islington was built by the Smithfield Club in the 1860s as a venue for their livestock and agricultiral shows. 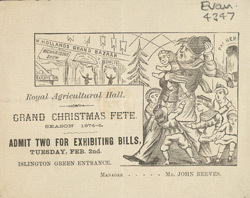 By the late 1800s, however, the hall was a popular venue for variety entertainment, including the Christmas Fete advertised here. Among the other functions held here were the legendary Crufts' dog show and the RAC's Motor Show.